A chance sighting of a familiar North Mymms landmark on an old map in Oxford’s Bodleian Library led researcher Anne Rowe to uncover some previously unrecorded history about the former gardens at Gobions. 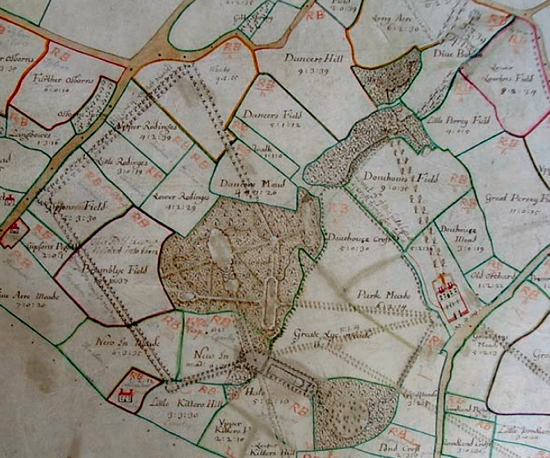 An 18th century map that featured the estate had been wrongly catalogued. Anne’s find led her and historian Tom Williamson to piece together a fascinating insight into the gardens that once adorned the North Mymms estate. Anne and Tom have given the North Mymms History Project permission to reproduce their research on this site. Gobions in Hertfordshire was one of Charles Bridgeman’s most significant designs, and was considered by Horace Walpole to represent an important stage in the development of the ‘landscape’ style. Gobions house was demolished in the mid-nineteenth century and the gardens survive as a complex of earthworks buried in woodland. The recent discovery of a hitherto unknown map in the Bodleian Library, Oxford – possibly a design by Bridgeman himself – throws much new light on the character of the site, as well as raising more general questions about the use of maps in the study of garden history. Gobions (or Gubbins), in south Hertfordshire, was one of Charles Bridgeman’s most important designs, and among the most famous gardens in early eighteenth-century England. It was the only other landscape to be described in any detail by George Bickham Jr in his The Beauties of Stow (1750), in which it is praised as a place of ‘surprising Greatness’ and ‘a sensible Resemblance in Miniature of Stow’. It was illustrated by both William Ryland (1732–83) and Jean Baptiste Chatelain (1710–58) and was singled out by Horace Walpole as a seminal landscape in which ‘many detached thoughts, that strongly indicate the dawn of modern taste’ could be observed. Gobions house was demolished in the 1840s, when its grounds were amalgamated with those of a neighbouring property, Brookmans, and only fragments of Bridgeman’s design survive, mainly in the form of earthworks. Their layout and appearance have, until recently, been known principally from engravings and, in particular, from an eighteenth-century estate map in the Gloucestershire Record Office (Plate V) and plans drawn up in 1815 and 1836, when the estate was put on the market and then sold, by which time the gardens had already been extensively simplified (Plate VI). The recent discovery of a previously unknown map in the Bodleian Library casts important new light on this landscape, but it also raises difficult questions of interpretation, some of which may have a wider relevance to our use of maps for understanding the character of past landscapes. (undated, early eighteenth century), north is towards bottom right. Gobions, a small estate of some 200 hectares (about 500 acres) in south Hertfordshire, was acquired by Jeremy Sambrooke, with wealth from the East India Company, in 1708 and he subsequently made numerous improvements to the property, commissioning James Gibbs to remodel the mansion and employing Charles Bridgeman to improve the grounds. The main area of gardens which he designed lay some 300 metres south of the house, within two conjoined areas of existing semi-natural woodland – Great Wood or Gobions Wood, and Dive Wood – and ranged either side of the valley of a narrow stream (a tributary of the Mimshall Brook). The ground slopes fairly gently from the site of the house towards the gardens, but in the immediate vicinity of the stream the valley is, like many in the local countryside, more deeply incised and steep sided, especially towards the west. To judge from the maps, engravings and contemporary descriptions, the gardens at Gobions featured hedged lawns in clearings, two canals, a large bowling green, a lake and cascade, and a number of statues and buildings. All were linked by straight and serpentine walks cut through the woodland, and by avenues running across the surrounding fields. Natural ‘swallow holes’, where the stream disappeared into solution hollows in the London clay, also appear to have been employed as ‘features’ in the gardens. I crossed the Road which leads to Gobions-House, and soon after turning on the Left, entered a delightful Path, which conducted me into a charming Wood. This Walk is irregularly cut through the Underwood, but the lofty Oaks which overshadow it are not disturbed. After being pleased with this pretty Sort of Labyrinth for some Time, I came suddenly into the most ravishing Spot that can be imagined. It is a perfect Rotunda, about the same Diameter with the Ring in Hyde Park. Here the Underwood is entirely taken away, but the Oak Trees, which are very strait, and vastly high, remain entire. They are a great many, and the Ground between them is entirely covered with a thick, short Moss of the Colour of Gold. The whole is surrounded by a Gravel Walk, about eight Feet wide. On one Side is a large Alcove ... Opposite to the Place of my Entrance into this sweet Recess, is another Avenue, which brought me to a large Alcove, situate at the End of an oblong Piece of Water; on each Side of whose Banks are fine Gravel Walks, lined with Rows of Trees. This Pond is so formed, that a Part of it is deep, and therefore the Bottom not easily seen; but the other Part is shallow, and it may be filled and emptied (as may the other Reservoirs here) at Pleasure. The Grass and the Bottom, when covered with Water, hath a sweet Effect. Having seated myself under the Alcove, I had a View over the Water to a fine large Figure of Time, rising from the Base, with his Wings prepared for Flight, and holding a large Sun-Dial in his Hands; beyond whom, through a Vista, the eye is infallibly led to an Obelisk, at a considerable Distance, beyond the Gardens. Having left this Spot, I turned to the Right, through a beautiful Walk of Trees, that led me to the Mansion-House ... from whence I was conducted by one of the Gardeners through a most superb and elegant Walk, which terminated at a Summer-House, built of Wood in the Lattice Manner, and painted green. We then turned to the left, through meandering Walks, cut through the Underwood (the umbrageous Oaks also here being entire) to a very affecting Grotto; which having passed, a large Arch presented itself across the Walk, and through that I beheld a most ravishing Cascade. ... I turned to the Right, when a winding Walk brought us to a Seat, where the Cascade has a more distant Sound. From the last mentioned Seat a pretty Walk brought me to a good Statue of Hercules, in his leaning Position; from whence, through a verdant Arch, appears a beautiful Canal; at the End of which is a handsome Temple, whose Front is supported by four Pillars. In this Temple are two Bustoes of the two Ladies who now are the Possessors of this desirable Place; that is to say, according to the Words of my Guide, Madam Sambrooke and Madam Betty: They seem to have employed a masterly Statuary; but I could not forbear wishing, that the Back, rather than the Face, of that athletic Greek had been turned towards them, which would have been more consistent with Decency. A number of buildings and structures are thus described or illustrated in the various sources, in addition to the principal elements – clearings, bowling green, canals, lake and cascade. 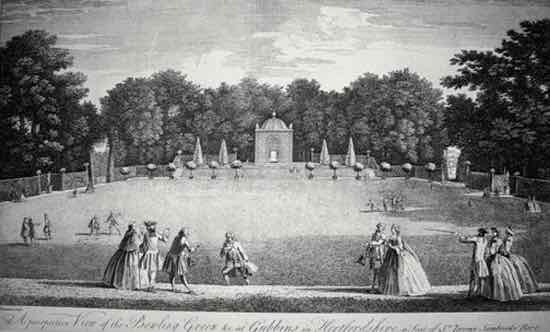 Firstly, there was the summer house by the bowling green, illustrated by Chatelain and described by Bickham (Figure 1). This is sometimes said to have been designed by Gibbs, but although there is a drawing by him for an octagonal temple ‘for Mr Sambrooke of Gubbins’ in the Ashmolean Museum, Oxford, this is clearly a different building. A second Gibbs drawing in the same collection shows an octagonal dovecote, probably that mentioned in the two descriptions. There was also a Lattice-Work Summer House, described by Toldervy but for which, until recently, no illustrations were known; the ‘Temple by the Canal’, again described by Toldervy and illustrated in one of Chatelain’s two engravings (Figure 2); a rotunda containing a statue of Hercules, shown in the distance on Ryland’s engraving; numerous statues, including Cleopatra and a ‘Roman gladiator’; an obelisk standing at the end of a vista ‘beyond the gardens’; a grotto; and an arch. Curiously, the most important structure which survives from the gardens is not specifically mentioned in either description; nor does it appear on the engravings or on the estate map. 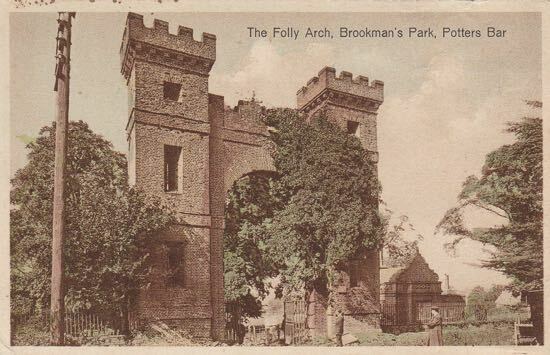 This is the ‘Folly Arch’ which stands close to the southern boundary of the estate, well to the south-west of the main area of the gardens and originally linked to them by an avenue, felled as recently as the 1940s (Figure 3). This is also said to have been designed by Gibbs, a plausible attribution although without any direct supporting evidence. 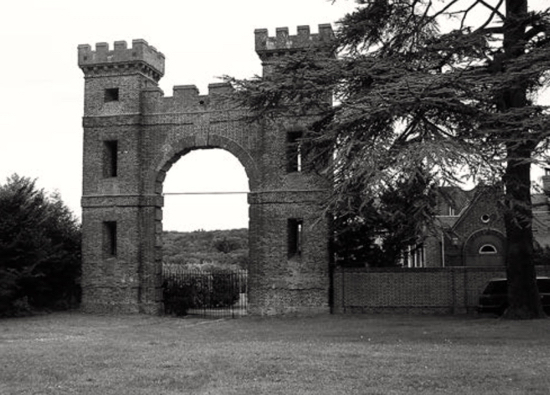 It is an unusual structure: a brick-built castellated arch with narrow turrets and numerous windows, a rare exercise in early eighteenth-century medieval revival but with openings which are entirely of classical rather than pointed ‘gothick’ form. of Sr. Jeremy Sambrooke Bart.’, an engraving (1748) by Jean Baptiste Chatelain. Sr. Jeremy Sambrooke Bart.’, an engraving (1748) by Jean Baptiste Chatelain. Figure 4. The ‘Bodleian map’ of Gobions. North is towards the top left. 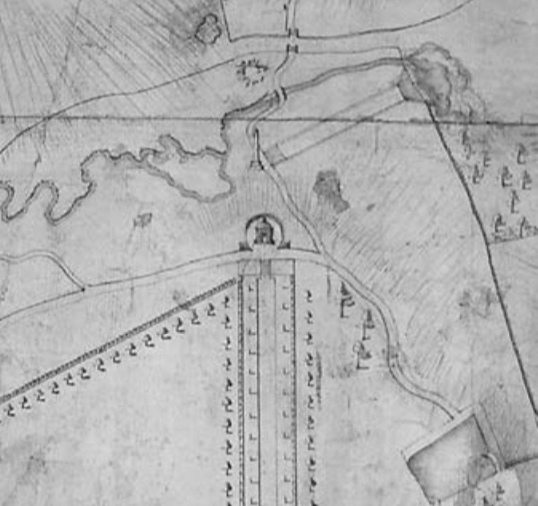 Unlike other drawings associated with, or attributed to, Bridgeman in the Bodleian Library, the newly discovered plan does not form part of the Gough Collection, and it is erroneously described in the catalogue as a ‘Map of North Mimms Park’,  presumably because the only place-name written on it is that of North Mimms Common, which lay immediately to the east. 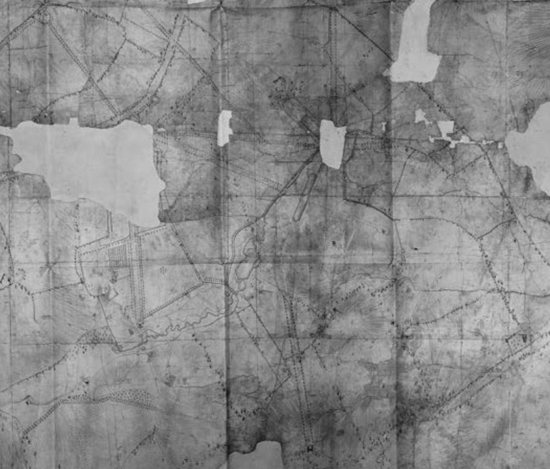 The map is large, dirty and in poor condition, with several holes – the most notable occupying the area on which the house stood (Figure 4). It is folded many times over and bound into a board cover to resemble a very large book. It appears not to have been completely finished – only some of the trees have been filled in around the ‘rotunda’ of open ground described by Toldervy, and the ramps of the terracing below the Bowling Green Summer House are not shaded and seem uncompleted when compared with those drawn around the seat at the end of the tree-lined vista running north from the house. The map makes an interesting comparison with the estate map in the Gloucestershire Record Office, on which earlier discussions of the gardens have largely been based (Plate V and Figure 4). Surveyed by one Thomas Holmes (and hereafter referred to as the Holmes map) this is undated and it is uncertain when, and by whom, it was attributed the date of ‘c.1735’ which appears in the Record Office catalogue, and which has subsequently been repeated by researchers and commentators. The map shows the main outlines of the gardens – the pattern of paths, clearings, water features – and a network of avenues running through the wider landscape. However, it fails to show, in any detail, earthworks of terraces, etc. within the gardens, or the location of the cascade, and it only depicts a single building – the summer house or temple by the bowling green – and that only in plan. The Bodleian map provides far more detail, and by combining it with Toldervy’s description it is possible to suggest the locations of most of the principal features of the gardens (Figure 5). Of particular importance are the vignettes included on the map of the various ornamental buildings which formed focal points in the design. The Bowling Green Summer House is shown almost exactly as drawn by Chatelain (Figure 6); and the Folly Arch is depicted precisely as it appears today (Figure 7). The map also includes an elevation of the Lattice-Work Summer House recorded by Toldervy in 1762 (Figure 9), confirming its position at the end of the formal walk leading south from the house. It is shown as circular and surmounted by a domed roof topped with a finial. It was raised slightly above the ground, encircled by a low fence and stood within a circular enclosure defined by a high fence which was apparently planted with espaliers. 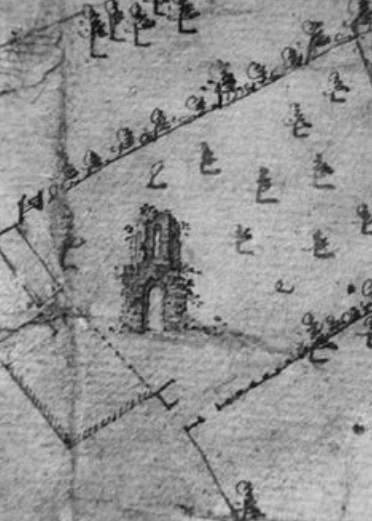 More importantly, the map shows another building, unrecorded in any of the other sources, which stood (like the Folly Arch) some way from the main area of gardens, towards the edge of the estate (Figure 8). This was a sham ruin, positioned near the south-east corner of the property, on rising ground to the north of Swanley Bar Lane (at TL259031). 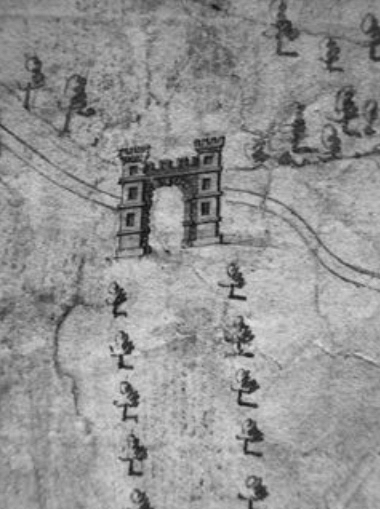 If, as seems likely, the Bodleian map was drawn up before Bridgeman’s death in 1738, this structure (which may likewise have been by Gibbs) represents a particularly early example of its kind designed for an English landscape garden. It does not appear to have ever been constructed. Figure 9. Detail of Figure 4: Lattice-Work Summer House and associated features. The layout of paths, watercourses, and other features within and around the gardens is also depicted in far greater detail on the Bodleian map than on the Holmes survey. For example, the formal walk leading south from the house to the Lattice-Work Summer House is shown to have had steps just before the latter was reached (Figure 9). The walk itself comprised a path, probably gravelled, which was bordered by long narrow lawns with pairs of (?) columns regularly spaced along their entire length, which were in turn flanked by straight hedges. 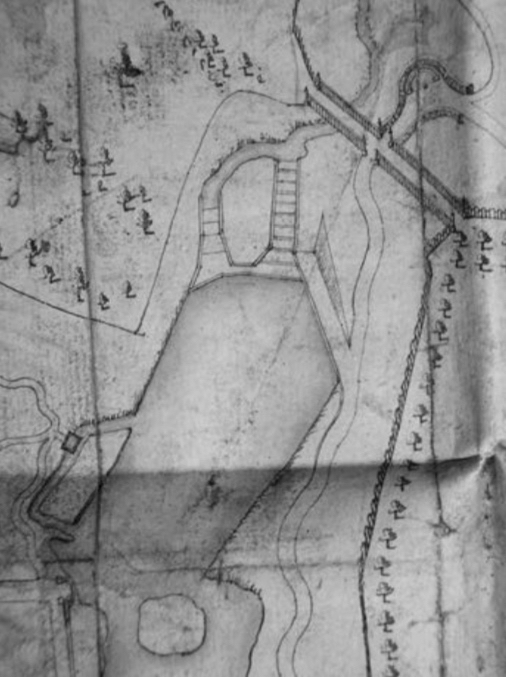 The map also provides a clear impression of the main earthworks within the gardens, although largely confirming their form as this exists today, and as recorded in the Landscape Design Associates’ unpublished report. The complex ranked terraces at the north-eastern end of the bowling green, below the summer house, are shown in detail, set within a semicircle and terminating in a broad, straight terrace with rectangular seats facing each other at either end (Figure 6). The various bridges leading over the watercourses, all apparently constructed of wood, are shown with particular clarity; a horseshoe-shaped feature on a bastion at the west end of the cascade is illustrated, almost certainly the site of the grotto; and a rectangular structure projecting over the side channel running past the lake (Figure 10). The lake itself is also illustrated in much more detail than on the Holmes survey, and the location of the cascade clearly shown (there were in fact two of them, immediately below the lake, to either side of an island defined by two roughly parallel channels of the stream). Figure 10. 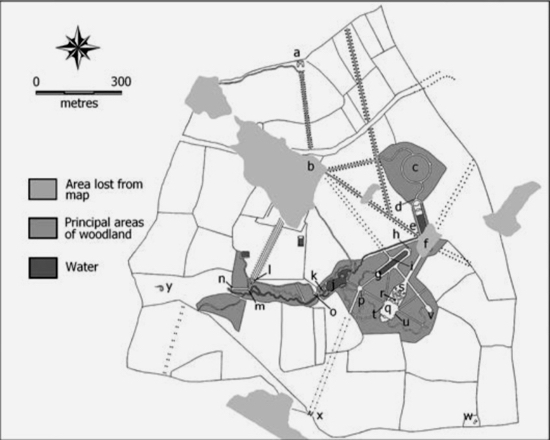 Detail of Figure 4: paths, lake, cascades and other features in Gobions Wood. The landscape around the woodland gardens is likewise portrayed with significant differences on the two maps, with the Bodleian showing fewer hedges, so that the area has rather more of a park-like appearance. It also indicates that the main area of gardens, in Great Wood, was fenced all along its northern and western sides: the southern edge and the boundaries of Dive Wood were apparently hedged. Yet while the Bodleian map shows numerous features that do not appear on the Holmes survey, the converse is also true. Holmes thus shows an avenue running across fields, south-east from the lawn featuring the statue of Time at the southern end of the rectangular pool, leading to a rond point well outside the gardens. From here another avenue runs south-west, to another rond point by Swanley Bar Lane; and from here a third runs westwards, a little to the north of the lane; to meet a fourth coming south-west from the gardens at a point which the Bodleian map (but not the Holmes survey) shows was occupied by the Folly Arch. Only the first and last of these alignments is shown by the Bodleian map: the other two are absent. Figure 11. Detail of Figure 4: seat terminating the avenue running north from the mansion. More importantly, although the Holmes map has been reproduced and discussed as if it were a straightforward survey, it is in fact a multilayered artefact, like a number of other estate maps. Whatever the date of the original survey, what we have today is a more complex document, with a ‘history’ rather than a simple ‘date’. Careful inspection shows that the original map did not include the gardens or most of the avenues and has been modified extensively in order to accommodate them. Trees have thus been erased within the wood, as has most of the name of the wood itself, while symbols representing shrubs and hedges have been added beside the main allées. 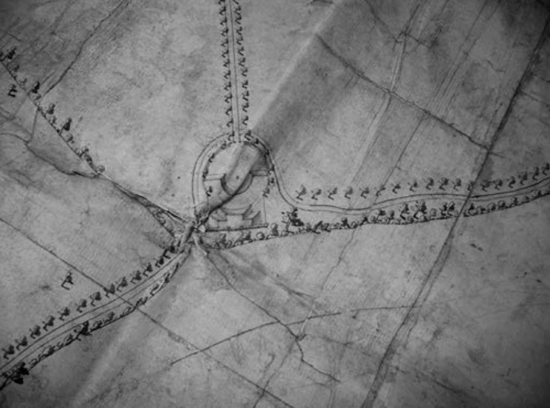 The map, in fact, employs a variety of tree symbols and it is clear that the main avenue running south from the house, with taller trees, is an original feature while the others, which have smaller ones, have been added: this is confirmed by the c.1718 map which only shows this axial avenue. Various smudges indicate where original writing and drawing have been replaced; significant removals include a building to the west of the house. In short, the gardens and almost all the avenues shown on the map are later additions rather than being features of Holmes’s original survey. What, then, of the newly discovered Bodleian plan? It is similar to a number of drawings thought or known to be by Bridgeman or his associates, most notably the 1738 plan of Amesbury – signed by Bridgeman – in which the depiction of trees in woods and shrubberies is closely comparable; the plan of Sandbeck Park in Yorkshire, made in c.1721 and plausibly attributed to him, where the slopes are shaded much as on the Gobions plan and the trees are again very similar; and the plan of Claremont, again c.1721 and attributed to rather than signed by him. In addition, some of the lettering on the plan is close to Bridgeman’s hand as preserved, for example, on letters and bills. Against this, it should be noted that few of the plans attributed to Bridgeman include elevations of garden buildings, which are such a noteworthy feature of the Bodleian map. Unlike the Holmes survey, the Bodleian map was evidently drawn to show only the designed landscape at Gobions – the house, gardens, ornamental buildings and avenues – rather than the wider estate. 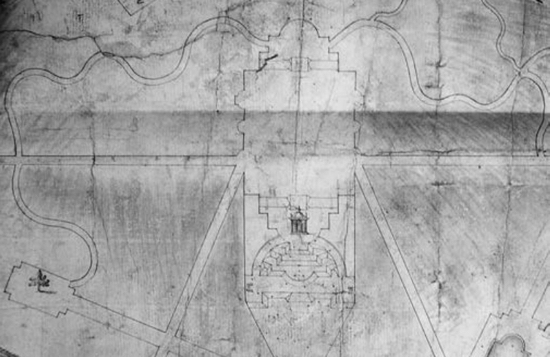 This would appear to indicate that it represents the original design for the new landscape, but it is also possible that it is more analogous to the plans created following the completion of the gardens at Stowe, to show the finished works. There are a number of difficulties with both interpretations. If the map were made to show the completed grounds it seems odd that it includes a number of features which, on the available evidence, were never executed, or were perhaps created at a different location. The walk leading from the obelisk below the Lattice-Work Summer House to the viewpoint overlooking the swallow holes, for example (Figure 9), does not appear on later maps, such as the 1836 sale plan, and has left no archaeological trace on the ground. There is similarly no evidence that an obelisk was erected in this position and, more importantly, there is no clear evidence that the ruin on Swanley Bar Lane was ever in fact constructed. Circumstantial evidence suggests, however, that an obelisk may have been built here, in place of the ruin. The Bodleian plan indicates that the ruin was placed where it was in order to terminate a vista which continued the alignment of the oblong pool located to the north of Great Wood and the main area of the gardens; and it was from the alcove standing at the north end of this pool, and looking towards the statue of Time which stood on the lawn at its southern end, that Toldervy described how ‘the Eye is infallibly led to an Obelisk at a considerable Distance, beyond the Gardens’. 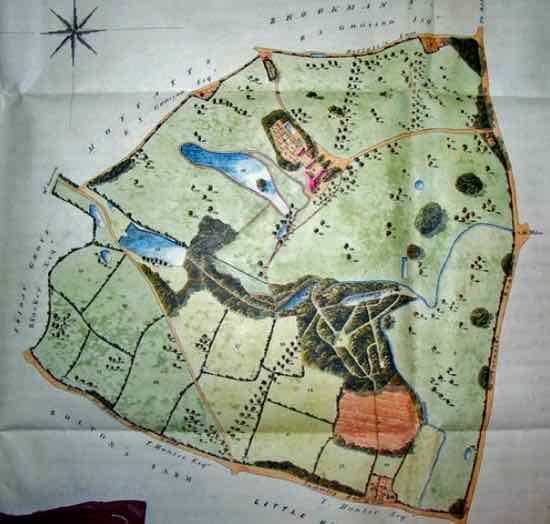 Evidence that something was constructed on this site is provided by the small-scale map of the county of Hertfordshire surveyed by Andrew Dury and John Andrews, published in 1766. This shows what is clearly some kind of ornamental structure at this point, apparently a symbol rather than an accurate portrayal. Yet while the map shows features of the gardens which were never apparently created, it also fails to show a number that were, most notably the temple which was erected at the head of the canal, illustrated in the engraving by Chatelain, which was almost certainly an early, if not original, part of the design. All this suggests that the Bodleian plan is essentially a design for the grounds, not all of which was executed; but if so, it seems strange that the Holmes map should include further proposals, for rather formal features (the three avenues), which were likewise never created. The greatest puzzle, however, concerns the Bodleian map’s treatment of the Folly Arch. Like the other buildings illustrated, this is shown in elevation and with considerable accuracy – even the number of battlements, both above the arch and on top of the two turrets, is identical with the building as it exists today. The arch stands, as noted above, at the end of an avenue running south-west from the gardens. Yet although this avenue is shown with precisely the same alignment on the Holmes survey, later maps leave no doubt that, as actually planted, it followed a rather different and more southerly course so that the arch today, and presumably as erected, stands some 65 metres to the south-east of the location shown by the Bodleian map. Why both maps show the orientation of the avenue, and the position of its termination, in the manner they do remains unclear. Neither the Holmes survey nor the newly discovered Bodleian map can thus be considered as accurate representations of an existing landscape, and rather than representing a ‘grand plan’, carefully followed, the Bodleian map probably represents one stage in the evolution of this important design. This said, it probably does show the gardens at Gobions largely as they were first created, with the exceptions already noted. It is thus unfortunate that the map, and therefore the essential layout of the grounds, cannot be closely dated. 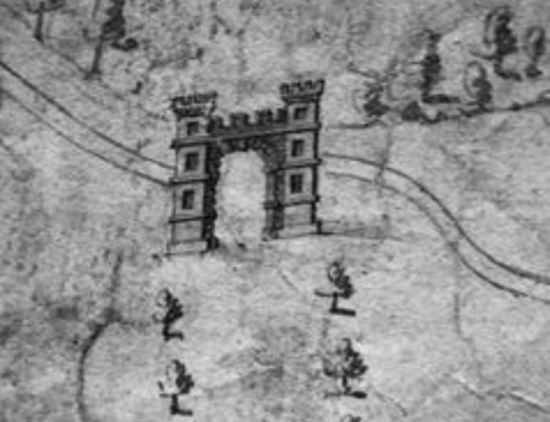 A number of writers have suggested that the Folly Arch was erected c.1735–40, and this, if true, would supply an approximate date for the Bodleian map, as whoever was responsible for it had clearly seen the designs for this feature. But there is no firm dating evidence for the construction of the arch. 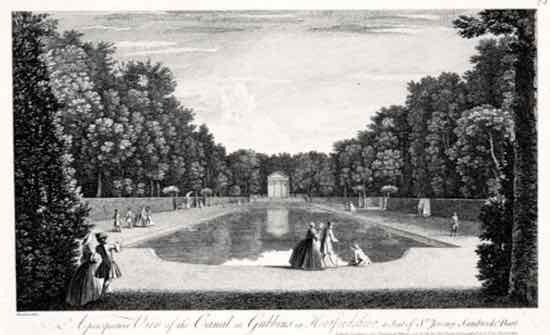 All that can be said with reasonable confidence about the date of the gardens is that they were already well developed by 1732, when they were visited by Queen Caroline,  and that they postdate 1718, as no trace of them appears on the map of Gobions of that date in the Hatfield House archives. Like several other gardens by Bridgeman in Hertfordshire, therefore, those at Gobions were largely a product of the 1720s, although it is likely that they continued to develop into the 1730s. Whatever the precise date of the Bodleian map itself, it serves in a number of ways to modify earlier interpretations of this important site. the unpublished conclusions of the Landscape Design Associates report, as already noted, suggested that the eastern section of the woods was more geometric and classical in character than the more ‘naturalistic’ western section, and while in broad terms this was certainly true, the extent of the difference appears rather less on the Bodleian plan than it does on the Holmes survey. At least two extra straight allées are shown in the western section, one terminating at a classical obelisk; conversely, a number of additional serpentine paths are depicted in the eastern part of the gardens. More importantly, the suggestion that the grounds were laid out according to a geometric scheme based on lines radiating from four points – Pigeon House, the statue of Time, the Hercules rotunda and the obelisk standing outside the woods, to the south-east – becomes harder to sustain given that this particular obelisk is absent from the point in question on the Bodleian map, and was either erected here at a later date or (as already suggested) on the site occupied on the map by the sham ruin. More importantly, the Bodleian plan, because it provides so much additional information about the gardens at Gobions, may help us to understand why Walpole rated them so highly, and considered them an important landmark in the development of the ‘landscape’ style. Bickham emphasized their ‘pleasing Variety of Prospects’, and Bridgeman certainly exploited the undulating local topography with considerable skill, ensuring the gardens’ various elements were visually linked in a tantalizing fashion, inviting exploration. And there was much to be explored: the Bodleian plan shows that the gardens covered a rather larger area than was previously thought, extending not only to the south-eastern extremity of the estate but also to its south-western corner, along the valley of the stream, where the pair of seats on the semicircular platform, overlooking the swallow holes, was located. The design also extended far to the north of the house where, as noted, a seat was placed on an eminence at the end of an avenue. While the main area of the gardens was contained within the woodland beside the stream, much of the estate was thus crossed by walks, or was incorporated into carefully composed views, recalling Joseph Addison’s famous rhetorical question of 1712, ‘why may not a whole estate be thrown into a kind of garden?’, and looking forward to the kind of ferme ornée developed by Philip Southcote at Woburn in the late 1730s and William Shenstone at the Leasowes in the 1740s. In particular, the sites of the proposed sham ruin and the Folly Arch, themselves rather unusual and innovative features in the 1720s or 1730s, were chosen with particular care so that each would form a dramatic, romantic silhouette on the skyline when viewed from the appropriate parts of the gardens. These, and the various statues and buildings, appear to have been incorporated into iconographic schemes or, at the very least, embodied specific allusions and references. The ‘Gothick’ features, for example, may have been intended to alert the observer to the earlier history of Gobions, as the home of Sir Thomas More’s family and, later, as a property belonging to Queen Elizabeth (the 1834 sales particulars described how Elizabeth I had supposedly passed under the Folly Arch ‘on her visit to Gobions, in the Year 1560’). Above all, the Bodleian plan indicates, perhaps more clearly than the Holmes map, how this elaborate landscape was not, to any significant extent, focused on Gobions house itself. The only avenue aligned axially upon it unquestionably predates Bridgeman’s involvement, and while he utilized it in the design (as the path leading from the mansion to the Lattice-Work Summer House) it was not employed as a major articulating axis within the new gardens. The designed landscape was, in consequence, something to be experienced in its own right, rather than functioning primarily as a setting for, or view from, the mansion, and it is noticeable how the latter appears almost as an incidental afterthought in Toldervy’s description of Gobions. In spite of Bridgeman’s reputation as a key figure in the development of the English landscape garden, none of these features is, in fact, very typical of his style. The relationship between house and grounds seems particularly novel. In Bridgeman’s designs, as in those of his seventeenth-century predecessors, monumental formality was usually constructed around views from and towards a mansion – what Peter Willis has described as Bridgeman’s ‘typical axiality’. A looser and more tangential relationship between a mansion and its gardens, together with the use of romantic gothick buildings, a pattern of paths designed to provide a succession of experiences, and the integration of large portions of the estate within an aesthetic scheme, are more reminiscent of the gardens designed in the late 1730s and 1740s, by William Kent in particular. It was probably for these reasons that Walpole discerned at Gobions the ‘dawn of modern taste’, and other eighteenth-century commentators considered the gardens to be of particular sophistication and importance. The authors would like to thank the Bodleian Library, Oxford, and the Gloucestershire Record Office for permission to reproduce the maps of the Gobions estate in their collections; Hertfordshire Archives and Local Studies for permission to reproduce the 1836 sale plan and Chatelain’s engraving of the Bowling Green; and St Albans Museums for Chatelain’s engraving of the Canal. We are also grateful to Bernard Spatz of the Gobions Woodland Trust for lending a copy of the report compiled by Landscape Design Associates. George Bickham Jr, The Beauties of Stow: or, A Description of the Pleasant Seat, and Noble Gardens, of the Right Honourable Lord Viscount Cobham (London, 1750), pp. 66–7. Horace Walpole, The History of the Modern Taste in Gardening (written before 1770); published in idem, Anecdotes of Painting in England (London, 1771); fully published (London, 1780), pp. 24–5. Peter Kingsford, ‘A history of Gobions in the parish of North Mymms, Hertfordshire’, in Peter Kingsford, Richard Bisgrove and Linda Jonas (eds), Gobions Estate North Mymms Hertfordshire (Brookmans Park: Gobions Woodland Trust, 1993), pp. 2–10; Kate Harwood, ‘Some Hertfordshire nabobs’, in Anne Rowe (ed. ), Hertfordshire Garden History: A Miscellany (Hatfield: University of Hertfordshire Press, 2007), pp. 53–7. ‘Map of an estate belonging to Jeremy Sambrooke Esq.’, Gloucester Record Office, D1245/FF75; plans attached to conveyances of 1815 and 1836, Hertfordshire Archives and Local Studies 34137, 34188. Harwood, ‘Hertfordshire nabobs’, pp. 49–77; Tom Williamson, ‘The character of Hertfordshire’s parks and gardens’, in Anne Rowe (ed. ), Hertfordshire Garden History: A Miscellany (Hatfield: University of Hertfordshire Press, 2007), pp. 1–25. Peter Willis, Charles Bridgeman and the English Landscape Garden, with supplementary plates and catalogue (Newcastle upon Tyne: Elysium, 2002), pp. 59–60; Harwood, ‘Hertfordshire nabobs’, pp. 52–3. Hertfordshire Gardens Trust and Tom Williamson, The Parks and Gardens of West Hertfordshire (Hertfordshire Gardens Trust, 2000), pp. 26–8. Willis, Charles Bridgeman, p. 62. Ibid., pp. 59–60; Alan Fletcher, ‘Charles Bridgeman at Tring Park: a reassessment’, in Anne Rowe (ed. ), Hertfordshire Garden History: A Miscellany (Hatfield: University of Hertfordshire Press, 2007), pp. 41–7; John Carswell, The South Sea Bubble (London: Cresset, 1960), p. 278. John Burke and John Bernard Burke, A Genealogical and Heraldic History of the Extinct and Dormant Baronetcies of England, Scotland and Ireland, 2nd edn (London, 1841), p. 541; Robert Clutterbuck, The History and Antiquities of the County of Hertford (London, 1815), I, p. 502. An earlier description, in French, appeared as an appendix to Les Charmes de Stow; ou Description de La belle Maison de Plaisance de Mylord Cobham par J. d. C. a Londres (1748), which Bickham incorporated into The Beauties of Stow published two years later; Terry Friedman, James Gibbs (New Haven and London: Yale University Press, 1984). Bickham, Beauties of Stow, pp. 66–7. William Toldervy, England and Wales Described in a Series of Letters (London, 1762), pp. 117–22. James Gibbs, untitled drawings of a temple and a dovecote, annotated ‘For Mr Sambrooke of Gubbins’, Ashmolean Museum, Oxford, Gibbs Collection: III, ff.87a, b.
 Nikolas Pevsner and Bridget Cherry, The Buildings of England: Hertfordshire, 2nd revd edn (Harmondsworth: Penguin, 1977), p. 113; Willis, Charles Bridgeman, p. 86. But see the comments in Friedman, James Gibbs, p. 301, that the arch is ‘not necessarily part of Gibbs’s contribution’. Landscape Design Associates, ‘Gobions Wood, North Mymms: Heritage Report’, unpublished report for Gobions Woodland Trust (2002). Bodleian Library MS, Maps Herts. a.1. ‘Map of an estate belonging to Jeremy Sambrooke Esq.’ surveyed by Thos. Holmes, undated, but said to be ‘c. 1735’, Gloucester Record Office, D1245/FF75. The sale map of 1815 shows a circular area at this point, while the 1st edition Ordnance Survey 6-inch map shows a circle of trees, suggesting that this was at least partially constructed (although neither map gives any indication of terracing). “Deeds of messuage and lands called Muffets, 1662–1802’, Hertfordshire Archives and Local Studies, DE/Bp/T9. ‘Survey by John Johnson of Barnet: estates of Jeremy Sambrooke in the parish of North Mymms’, Hatfield House archives, undated. The survey is annotated with various notes, the earliest of which is dated 1718. As also concluded by Landscape Design Associates, ‘Gobions Wood, North Mymms: Heritage Report’, p. 17. Andrew Dury and John Andrews, A Topographical Map of Hartford-shire, from an actual survey (London, 1766). For example, English Heritage, Register of Parks and Gardens of Special Historic Interest, entry for Gobions. Friedman, James Gibbs, p. 200. Gentleman’s Magazine (19 July 1732), p. 874. ‘Survey by John Johnson of Barnet: estates of Jeremy Sambrooke in the Parish of North Mymms’, Hatfield House Archives, undated. Christopher Gallagher, ‘The Leasowes: a history of the landscape’, Garden History, 24/2 (1996), pp. 201–20. Sale particulars, 1834, Hertfordshire Archives and Local Studies, 34417. Despite a strong local tradition that Elizabeth visited Gobions, there does not appear to be any good evidence that she actually did so. Willis, Charles Bridgeman, p. 60. This paper was first published in the journal of The Gardens Trust, Garden History, 40/1 (2012), pp. 82-97. 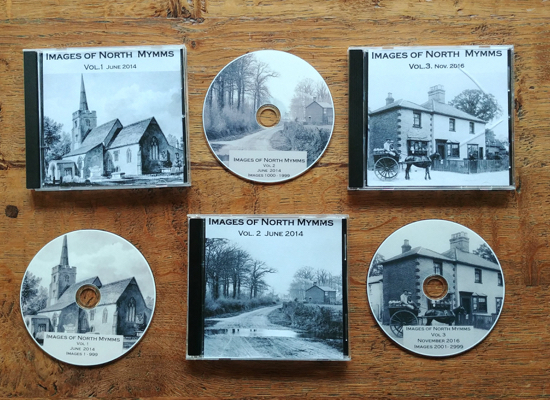 ‘Gobions Wood, North Mymms: Heritage Report’, produced by Landscape Design Associates and referred to in this paper, has been published on this site since the paper was written. We would like to thank the Bodleian Library, University of Oxford, St Albans Museums, Gloucestershire Archives, and Hertfordshire Archives and Local Studies for giving this site permission to reproduce their images.